The hardest part of making dinner is figuring out what to eat! 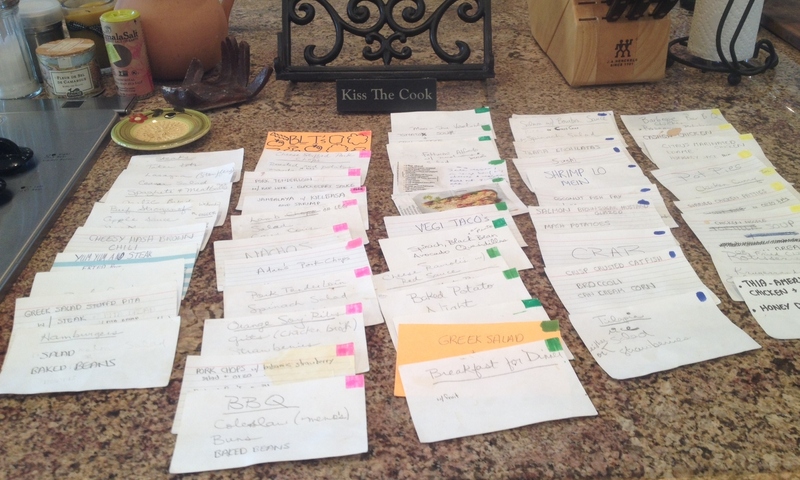 All credit for Meal Planning Made Easy! goes to my husband, Stephen. He is the best cook, grocery shopper and food taster (actually Tate is right behind him) in our home. As a family we sat down and everyone began writing down their favorite meals on index cards. The kids wrote down theirs too. Stephen had the bright idea to let each child choose one meal they wanted to have each week. Stephen and I would choose as well and then the other two nights were to be a mix of leftovers and dining out. Initially, we just wrote the meal on the front. Then Stephen started writing the instructions on the back. 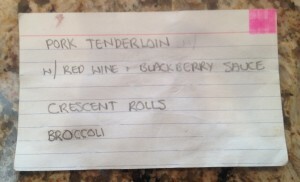 Before I knew it, Stephen came up with a color system to identify what meat/non-meat was featured. This really helped because we always ended up with lots of chicken dishes leftover. Right now we have about 60 cards. We do from time to time vote on a meal. In our house the majority rules. My husband and I have lost some pretty good recipes in this manner, but we prepare these on special occasions when it is just the two of us. Rare, but it does happen. This system can be very straight forward like ours or you could really make it cute. 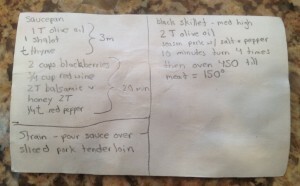 You could use nice recipe cards and different colored pens to identify the meat /non-meat dish. Ours is very utilitarian. If you look closely, you will notice the tell tale signs of blackberry sauce and use. We keep a copy on the fridge and the kids know to write what they need on it. 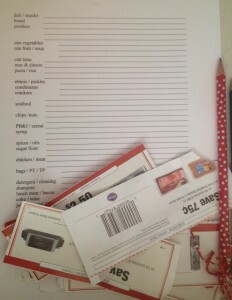 We also keep our coupons with our paper list so that we can remember to use them. I am so bad at remembering that I usually staple them to the corner of the list. When the meal is over, we put it in a magnetic container on the side of the fridge… not to be seen again for almost 2 months time. Cheers to dinners where everybody is happy!